…past the graveyard…..and then turn left on to Bakers Road. 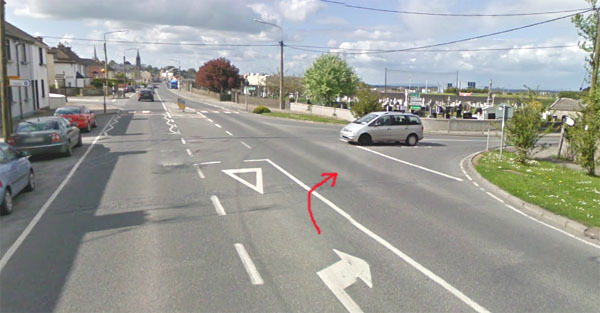 If you are coming from the direction of Limerick City then after you pass the Topaz station on the left as you enter the town, take a left before you get to the main church. 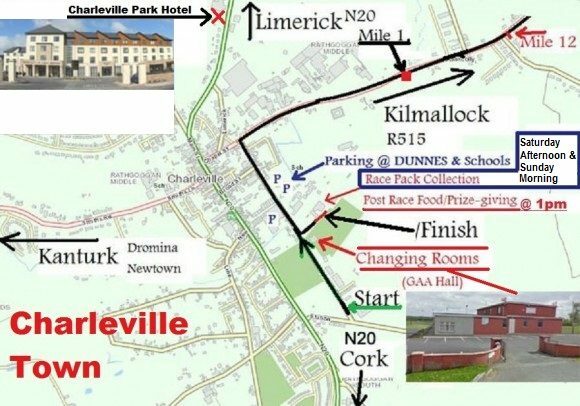 The turn will be signposted for Killmallock…. …then left at the next T-junction and then right on to Bakers Road. This is an overview of the town for whatever direction you may come from! It clearly shows Bakers Road parallel to the main road and the approach roads. Follow the stewards directions on the day for parking. The free changing facilities and showers are in the local GAA hall (pictured in map and is red building in picture below) which is right alongside the entrance to St.Josephs. Parking will NOT be available on the St. Josephs site on Sunday but runners can drive in to the back of the site to collect numbers on Saturday. There is adequate FREE PARKING in Dunnes Stores car park, schools and other car parks which are adjacent to the site at St. Josephs. People will be directed by Marshalls to the parking areas. There will be no on-road parking allowed by the Gardai. Please take any rubbish home with you as these are private facilities. Race Pack Collection will take place on Saturday and Sunday in St Josephs Foundation. Entrance at the back of the site in Sportshall beside the Athletics track. More details on the Race Weekend schedule page. There will be NO NEW ENTRIES on Saturday or Sunday.